Utrecht, 23 Jan 1579; Deputies from six provinces of the Habsburg Netherlands met here to sign an historic agreement which pledged all of them to act together as allies in the event of war. Even more significant in the treaty was their agreement that each province should be able to govern itself in its own way. For the first time, no mention of the Spanish king's name has been made; nor of the maintenance of the Catholic faith; nor of any question of reconciliation with Spain. 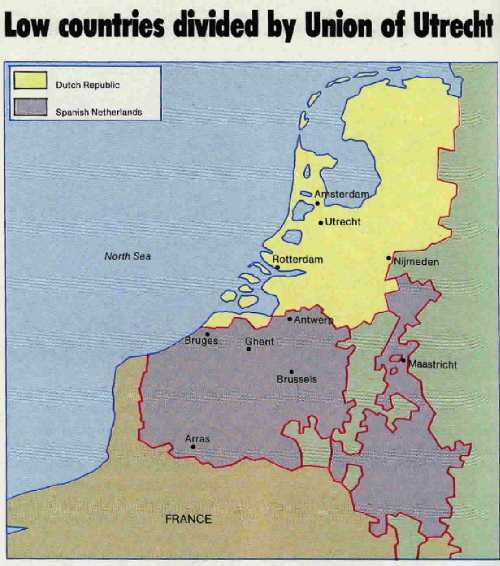 It was doubtful whether the Union of Utrecht would succeed in unity the Low Countries, however. Earlier this month at Arras the Walloons, the Catholics in the south of the region, joined a union witht he states of Hainaut and Artois and opened talks with the Spanish overlord, the duke of Parma, so a new Catholic powerbloc might emerge. The effect of these separate agreements could only be to split a nation, already deeply divided by religious beliefs at a time when Spain was facing new treats from the Turks in the Mediterranean. All hopes that the new Habsburg governor, Don John of Austria, might resolve matters had died with him in a new outbreak of plague.